Loewe and Geiger on the Medal. Outside the circle, on both sides of the head, occurs and below, "umilitas, Ωροσις," the latter a misspelling of ταπείνωσις. 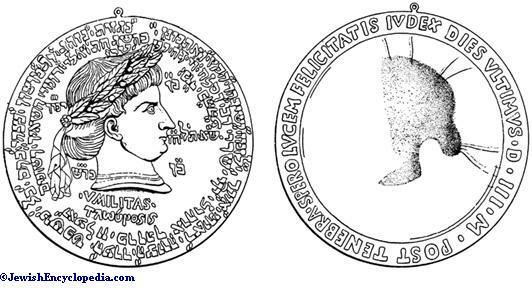 The reverse of the medal represents a dark ground around which runs the legend, "Post tenebras spero lucem felicitatis judex dies ultimas D.III.M." Menestrier the Jesuit, in his "Histoire de Lyon" (1696), was the first to describe the medal and to endeavor to interpret the legend. In his opinion the figure represents Louis le Débonnaire, and the legend expresses the gratitude of the Jews toward this king, who permitted them to build a synagogue. This opinion respecting the head was held by many, among whom were De Boissi ("Dissertation Critique"), S. Löwisohn ("Vorlesungen"), and Carmoly ("Mémoire sur une Médaille en l'Honneur de Louis le Débonnaire"); they differ only in the interpretation of the legend. It was only in 1836 that Gerson Levi called attention to the fact that the figure could not be that of Louis, because there existed no medal with the effigy of any French king earlier than Charles VII. 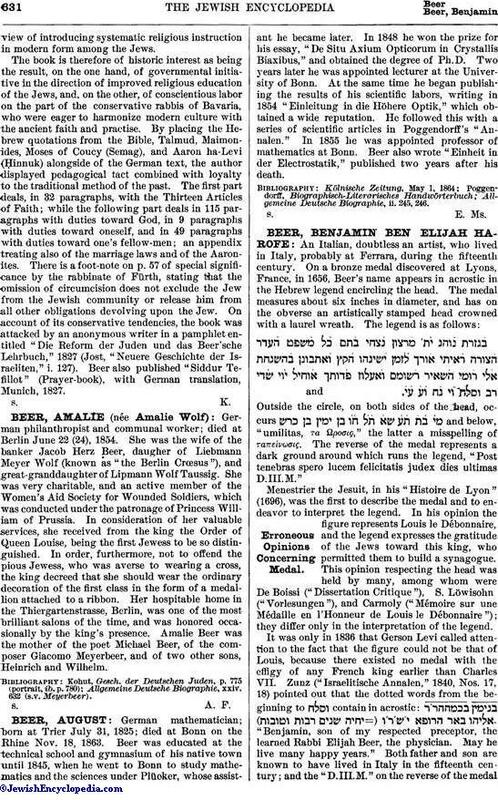 Zunz ("Israelitische Annalen," 1840, Nos. 17, 18) pointed out that the dotted words from the beginning to contain in acrostic: ( "Benjamin, son of my respected preceptor, the learned Rabbi Elijah Beer, the physician. May he live many happy years." Both father and son are known to have lived in Italy in the fifteenth century; and the "D.III.M." on the reverse of the medalmay represent the year (1503) in which the legend was written. 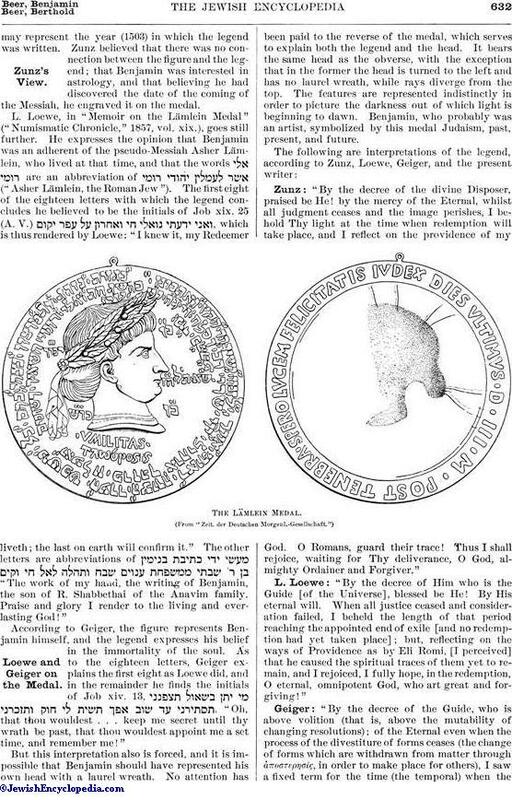 Zunz believed that there was no connection between the figure and the legend; that Benjamin was interested in astrology, and that believing he had discovered the date of the coming of the Messiah, he engraved it on the medal. 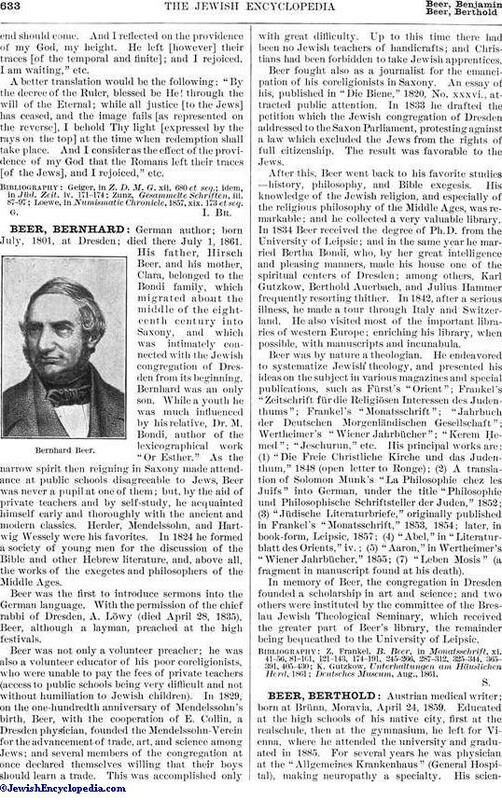 L. Loewe, in "Memoir on the Lämlein Medal" ("Numismatic Chronicle," 1857, vol. xix. ), goes still further. He expresses the opinion that Benjamin was an adherent of the pseudo-Messiah Asher Lämlein, who lived at that time, and that the words are an abbreviation of ("Asher Lämlein, the Roman Jew"). The first eight of the eighteen letters with which the legend concludes he believed to be the initials of Job xix. 25 (A. V.) , which is thus rendered by Loewe: "I knew it, my Redeemer liveth; the last on earth will confirm it." The other letters are abbreviations of "The work of my hand, the writing of Benjamin, the son of R. Shabbethai of the Anavim family. Praise and glory I render to the living and everlasting God!" According to Geiger, the figure represents Benjamin himself, and the legend expresses his belief in the immortality of the soul. As to the eighteen letters, Geiger explains the first eight as Loewe did, and in the remainder he finds the initials of Job xiv. 13, , "Oh, that thou wouldest . . . keep me secret until thy wrath be past, that thou wouldest appoint me a set time, and remember me!" But this interpretation also is forced, and it is impossible that Benjamin should have represented his own head with a laurel wreath. No attention has been paid to the reverse of the medal, which serves to explain both the legend and the head. It bears the same head as the obverse, with the exception that in the former the head is turned to the left and has no laurel wreath, while rays diverge from the top. The features are represented indistinctly in order to picture the darkness out of which light is beginning to dawn. Benjamin, who probably was an artist, symbolized by this medal Judaism, past, present, and future. "By the decree of the divine Disposer, praised be He! by the mercy of the Eternal, whilst all judgment ceases and the image perishes, I behold Thy light at the time when redemption will take place, and I reflect on the providence of my God. O Romans, guard their trace! Thus I shall rejoice, waiting for Thy deliverance, O God, almighty Ordainer and Forgiver." "By the decree of Him who is the Guide [of the Universe], blessed be He! By His eternal will. When all justice ceased and consideration failed, I beheld the length of that period reaching the appointed end of exile [and no redemption had yet taken place]; but, reflecting on the ways of Providence as by Eli Romi, [I perceived] that he caused the spiritual traces of them yet to remain, and I rejoiced, I fully hope, in the redemption, O eternal, omnipotent God, who art great and forgiving!" "By the decree of the Guide, who is above volition (that is, above the mutability of changing resolutions); of the Eternal even when the process of the divestiture of forms ceases (the change of forms which are withdrawn from matter through ἀποστερησίς, in order to make place for others), I saw a fixed term for the time (the temporal) when theend should come. And I reflected on the providence of my God, my height. He left [however] their traces [of the temporal and finite]; and I rejoiced. I am waiting," etc. A better translation would be the following: "By the decree of the Ruler, blessed be He! through the will of the Eternal; while all justice [to the Jews] has ceased, and the image fails [as represented on the reverse], I behold Thy light [expressed by the rays on the top] at the time when redemption shall take place. And I consider as the effect of the providence of my God that the Romans left their traces [of the Jews], and I rejoiced," etc. Loewe, in Numismatic Chronicle, 1857, xix. 173 et seq.